Tutorial to Fix Runtime Error 217 in Windows 10, 8.1, 8 and Windows 7! Nowadays the latest error called Runtime Error 217 is irradiating Windows user and prevent them from executing any program. This error will occur when user tries to run any installed application or software, there are lots of reason behind this error but some main causes are: attack of malware or computer virus, because of partial installation or un-installation of any application/program/software, malfunction in DLL registration will also generate this error, corruption is registry database, collisions between two programs while booting etc. Sometime this error will also appear when the user boot or start their computer. This error is one of the most irritating and dangerous error so it is necessary to get rid of this as soon as possible. 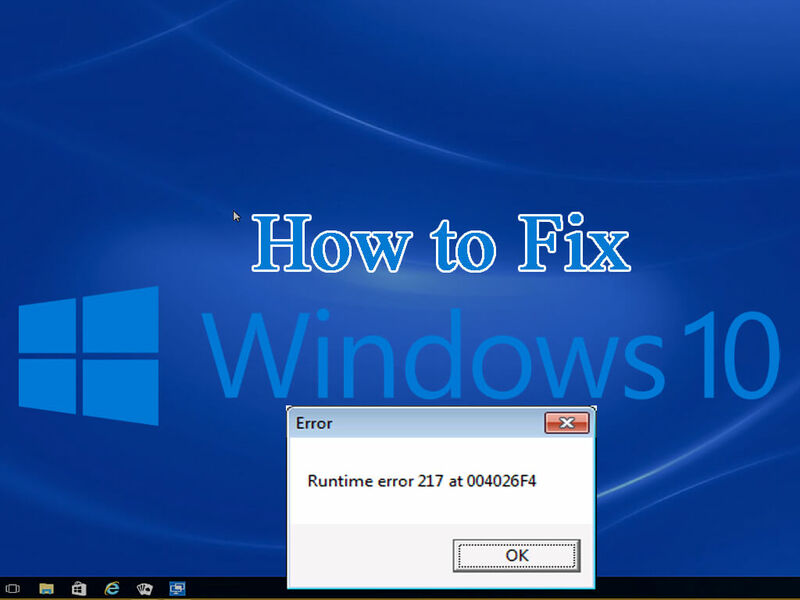 Below a complete guide is given that will help you to fix Runtime Error 217 in Windows 10/8.1/8/7. When one or more DLL file gets misplaced or damaged or fail to register. Improper installation of any program. When Msvcrt.dll which is a Microsoft Visual C++ file gets damaged or outdated then this error code may appear. Wrong regional settings may also generate a runtime error. An outdated or damaged Stdole32.dll file. Computer viruses or malware can also cause a runtime error. In order to fix this issue, you have to apply several solutions as there is more than one cause. Follow the below-given solutions one by one and check for the problem after applying each of them. Step 1: First you have to open “System Configuration” dialog box, to do this open run window by pressing Windows + R simultaneously. 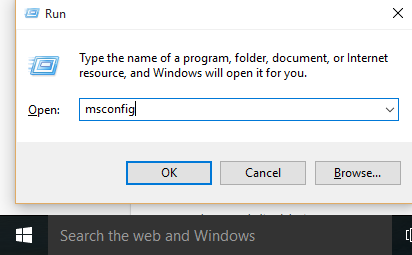 In run Window type “msconfig” and hit Enter key. 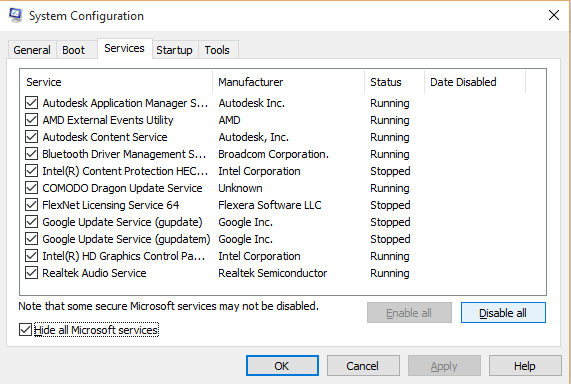 Step 2: At the “Services” tab, check the box “Hide all Microsoft services” and then click on “Disable all” option. Step 3: Click on Apply and then OK. Step 4: After it open “Task manager”. Step 5: Go to the “Startup” tab, choose one by one and “disable” all. Step 6: After step 5 close all the open windows and restart your Windows computer. First of all, Click Start and then select the option Control Panel. Next, select Clock, then Language and then select the option Region. In the last step, select the specific setting that has to be changed. If this runtime error 217 error, then it is because of the outdated Msvcrt.dll file. So, if it occurs when you have to update the file soon. You can do this by just clicking the Start Menu and while accessing the Control Panel, hit the Windows update tab. If you get this error because of incorrect regional settings on the system, then it is important to fix this issue as soon as possible. You can do this by going to the Start menu and then select the option Control Panel. After this, you will get an option called Clock, just click on Clock and then visit Language and Region settings. Now, select the specific regional settings and then save it well. If you get runtime error 217 because of virus issue then the best solution you can try is to download and install a powerful antivirus program. While running this antivirus program, you can scan your PC for viruses. After you complete the scanning process, the results will be displayed on the computer screen. So, after you see all the files, just click repair and proceed with the next required steps. Now you will see that the error is gone and system become normal, the above-given step is a little difficult for the normal user so it is necessary to apply them under the moderation of any computer professional. If you made a small mistake while executing the above-given command then you will generate many other errors by yourself. If you are unable to run these given steps due to lack of knowledge OR above given steps are unable to fix the issue then you can also go with the automatic solution. Under automatic solution you don’t have to execute any command manually, simply download and install PC Error Repair Tool for Windows and run it. This application is fully automatic and so that it will automatically find all of your computers. After listing all the issue present on your computer it will fix all of them one by one. This tool is packed with a very simple user interface so one can easily understand and run this tool to fix their computer. This application supports all the Windows operating systems such as Windows XP, Windows vista, Windows 7, Windows 8, Windows 8.1, and at last Windows 10. Runtime error 217 is one of the common errors that appear on the windows system due to any internal issue. If your system is suffering from this issue then above given information will help you. Now, even a normal user can solve many types of Windows system error without calling any computer professional. Is your PC suffering from Runtime Error 217, are you unable to run any application because of Runtime Error 217. Don’t worry and apply the given solution to get rid of this error.